Lawrence Solomon of Energy Probe thinks the Paris Accord is a dead parrot, as he writes in the Financial Post: Paris is dead. The global warming deniers have won. Excerpts below with my bolds. As Solomon sees it, events are unfolding in a way that proves Trump’s wisdom in withdrawing the US from the failing Paris Accord. The Global Coal Plant Tracker portal confirmed that coal is on a tear, with 1600 plants planned or under construction in 62 countries. The champion of this coal-building binge is China, which boasts 11 of the world’s 20 largest coal-plant developers, and which is building 700 of the 1600 new plants, many in foreign countries, including high-population countries such as Egypt and Pakistan that until now have burned little or no coal. 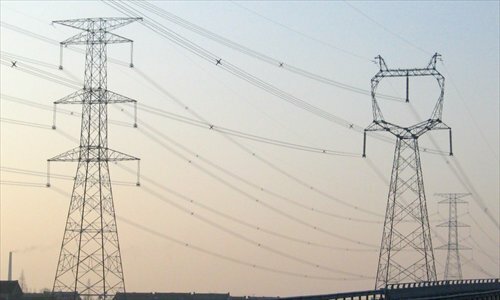 All told, the plants underway represent a phenomenal 43 per cent increase in coal-fired power capacity, making Trump’s case that China and other Third World countries are eating the West’s lunch, using climate change as a club to kneecap us with expensive power while enriching themselves. As reported by Bloomberg New Energy Finance, renewables investment fell in 2016 by 18 per cent over the peak year of 2015, and nine per cent over 2014. In the first two quarters of 2017, the trend continued downward, with double-digit year-over-year declines in each of the first two quarters. Even that paints a falsely rosy picture, since the numbers were propped up by vanity projects, such as the showy solar plants built in Abu Dhabi and Dubai. In the U.K., renewable investment declined by 90 per cent. None of the Bloomberg data represents hard economic data, however, since virtually all renewables facilities are built with funny money — government subsidies of various kinds. As those subsidies come off, a process that has begun, new investment will approach zero per cent, and the renewables industry will collapse. Even with Obama-sized subsidies, the clean-energy industry has seen massive bankruptcies, the largest among them in recent months being Europe’s largest solar panel producer, SolarWorld, in May, and America’s Suniva, in April. As reported in July in Daily Caller, solar panels create 300 times more toxic waste per kilowatt-hour than nuclear reactors — they are laden with lead, chromium, cadmium and other heavy metals damned by environmentalists; employ hazardous materials such as sulfuric acid and phosphine gas in their manufacture; and emit nitrogen trifluoride, a powerful greenhouse gas that is 17,200 times more potent than CO2 as a greenhouse gas over a 100-year time period. One recent admission comes from Oxford’s Myles Allen, an author of a recent study in Nature Geoscience: “We haven’t seen that rapid acceleration in warming after 2000 that we see in the models,” he stated, saying that erroneous models produced results that “were on the hot side,” leading to forecasts of warming and inundations of Pacific islands that aren’t happening. Other eye-openers came in the discovery that the Pacific Ocean is cooling, the Arctic ice is expanding, the polar bears are thriving and temperatures did indeed stop climbing over 15 years. As the Daily Caller and the Wall Street Journal both reported in April, Obama administration officials are admitting they faked scientific evidence to manipulate public opinion. “What you saw coming out of the press releases about climate data, climate analysis, was, I’d say, misleading, sometimes just wrong,” former Energy Department Undersecretary Steven Koonin told the Journal, in explaining how spin was used, for example, to mislead the public into thinking hurricanes have become more frequent. The evidence against Paris continues to mount. Paris remains dead. Beating a dead parrot is no better than beating a dead horse. The Paris Accord is dead if you look at it from the perspective of significantly reducing global GHG emissions. To achieve the aim of reducing global GHG emissions the near zero that was never going to happen. The aggregate impact of all the INDC submissions if fully implemented would still see emissions increasing in 2030. But the proponents of climate mitigation will not allow this to be recognized. They look inwards to the models, along with vague speeches and say it is still theoretically possible to achieve the aims. What is obscured is the policy gap. For instance, Myles Allen was commenting on the release of the Millar et al 2017, of which he was the big name co-Author. 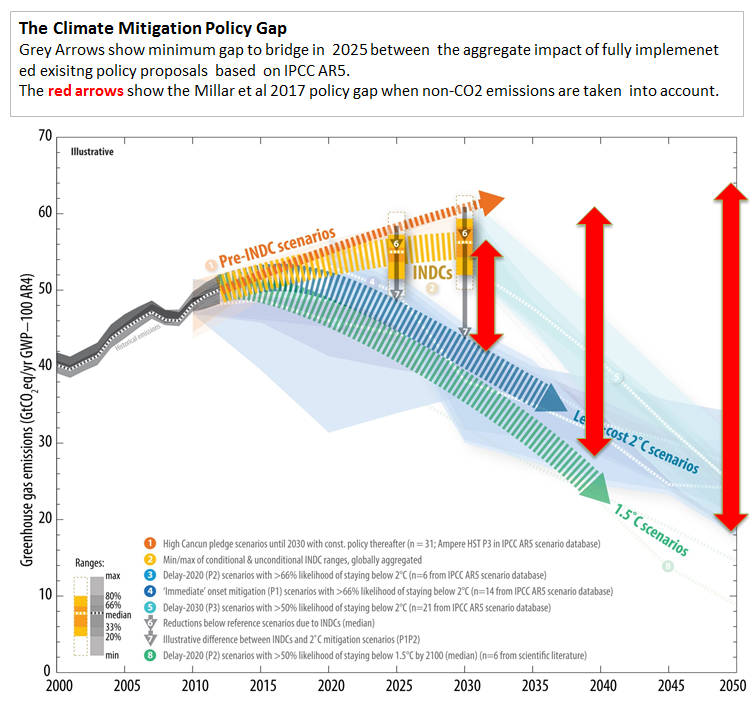 I have placed the policy gaps based on that paper onto a graphic produced by the UNFCCC summarizing the aggregate impact of the INDC submissions.